Well to be fair, the Vance of now is not the Vance when he was entering the NFL either. You look for traits and hope that coaching and their work ethic will let them develop. I really want the Steelers to favor the more dangerous pass catcher rather than draft the kid from LSU, Foster Moreau. There are so many good/great TEs in this draft class that the Steelers should not be shy in grabbing one, and do so early if they want. It is time, James is gone, Grimble is still the same enigma he has always been, and I love McDonald but the position is due for a high pick. To me Irv Smith Jr in round 2 or early 3, and then as my fallback, Oliver in late 3 or round 4. Both of them would be great backups/complements to McDonald. Both can be better blockers than James and also be more dangerous down the field catching the ball. Mark Bruener worked out Donald Parham, if I remember his pro day news correctly. That would certainly be a better pass catcher than Moreau. Or Knox from Miss St. Either this kid is saving himself for some team or is just one of those you get what you see. Any thoughts? So either Switzer isn't considered a return guy anymore or he should be real nervous? Thoughts? Steelers punt return team was 16th in the NFL. Switzer is... sorta average, maybe below average. I’m eager to improve returners this year. Why the Steelers continue to settle for below average returners is beyond me. However, I did think Switzer did a good job with what he had to work with at times. It's why I'm a big fan of adding Justice Hill in the 3rd Round. I like Switzer so great toughness as a WR and and ok returner but think it was more of Scheme for the return teams.I would not mind an upgrade but not a guy that jus a return guy. I also read about mark working this guy out who is a freak of nature at 6'8.I also heard Mark checked out Dissy from Wash. 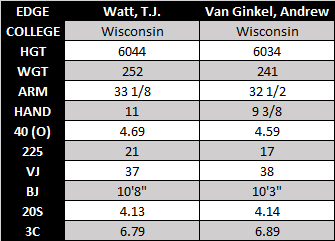 But also Health worked with a bunch of TE and should help out with info on TE that might be useful to what the steelers need. JJSS, Moncrief, Washington, Rogers, and Switzer. Don't think we draft a WR until the third day. Will compete with DHB for a roster spot. The problems in the return game have very little to do with the returner. Agreed Rum. The assembly of talents [IMO] is not necessarily the problem by itself. I think a Huge coaching deficiency is. Of course who could foresee the kicking and punting talent issues that evolved as the season unfolded? My hope is there are kickers/punters brought in for "Legitimate" competition and the proven better competitor is actually retained. Not the guy that everyone likes because his grandma makes killer chocolate chip cookies or whatever the reason for their decision last season to keep Berry and Boswell. How Danny Smith keeps his job every year is a mystery to me. I think Switz was fine as the return man last year, he got what was there, I have always thought Danny Smith particularly terrible in the return game. I also seem to remember a few of Smith's teachers pets costing Switz some longer returns last season. Again, supposedly Darius Heyward Bey was this god of special teams but have you ever noticed how many penalties he gets on special teams?? And Jordan Dangerfield?? I mean come on, these asses are kept on the team year after year for their special teams prowess yet they wiped out some longer Switz returns last season. Switz did have the 4th most kick returns over 20+ yards with 19, that may not sound impressive but it is, in all he had 22 punts/kick returns over 20+ yards. The year before the Steelers as a team had just 17 combined returns over 20+ yards. So, Switz had 5 more returns than the previous year over 20+ yards. It is progress. If they get rid of some of these deadbeats and put in younger, hungrier, faster, nastier athletes then maybe the returns units would improve dramatically. Also Switz did play through injury last year, I am hoping he is in top health and that may make a difference too. Unless I missed tagging someone as local, the Steelers are at 30. Florida Atlantic RB, Kerrith Whyte Jr.
*= Local visit, doesn’t count against team’s overall visit count. Unless there's been a rule change, WVU is not a local school. Askew Henry is from Aliquippa, which is why he counts as local. Miles Sanders is from Woodland Hills. Still, Labriola has confirmed 33 total visits, so who knows. 40 yard dash 4.46, 43.5" vert., 10'10" broad everything jumps off the page but the 3 cone of 7.40 is very poor. Rock Ya Sin might be the best CB in this draft and he posted a 7.31 3 cone. 7.4 is not ideal, but he doesn't seem to have any trouble covering guys on the outside or clicking and closing on plays underneath. I think, ultimately, he's a super dime backer who can blanket move TEs and he could even take a big WR in space. I think Rock Ya-Sin is a sleeper Steelers pick at #20. You know B2B that's what I first thought when seeing his measurables. A Burnett replacement. B2B, steelafan77, TB...take a look at the official visits. Can you list the players who tick the following boxes? Any of these guys universally praised for these traits? I can’t shake the feeling that they’ll pass on anyone who comes across as a dumbass in interviews or has character red flags regardless of their athletic prowess, production and scheme fit. We were a goddamn side show last season. Lots of scrutiny will be put on Mr First Rounder.